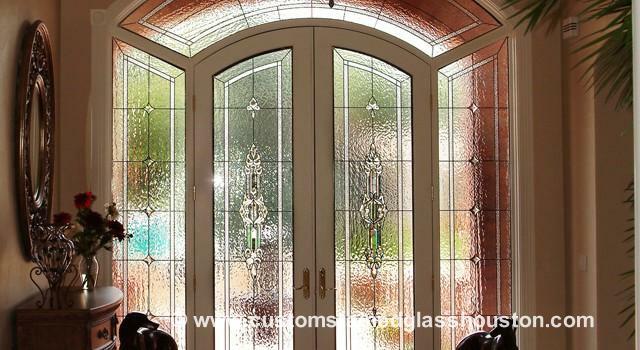 With so many Houston area homes having sidelights bordering their entryways, but these entryways requiring privacy, stained glass is an excellent option to consider. Adding stained glass to these windows makes sense. When a visitor walks to your door, you don’t necessarily want them to be able to see directly into your home. Unfortunately, for aesthetic, utilitarian, and even safety reasons, curtains and blinds often don’t make sense. The answer is of course to use some beautiful leaded or stained glass. Light is allowed into the room, while privacy is preserved. Front entryways are also the first thing guests see when entering your home. 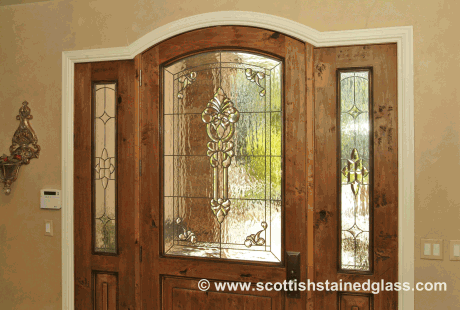 Stained glass sidelights allow you to make a great first impression. Attractive and elegant stained glass leaves those who visit your home admiring the custom art work you have incorporated into the home. Clients often think they are using color is these sidelights, but in reality, we almost never use colored glass for sidelights. Rather we favor clear beveled and textured glass which provides homeowners with and elegant and timeless look no matter how styles change. They also preserve the added value to your home, allowing realtors and perspective buyers to focus on one more positive addition to your home. If safety and security are a concern, stained glass added to your sidelights can allay fears and concerns about the wrong people being able to see inside your home. In addition Scottish Stained Glass can add a layer of protective clear glass to prevent the stained glass from being vulnerable to breakage.